So, my Live Below the Line challenge ends at midnight. And just in time. What food do I have left? Not much. Actually all I have left is around half a stick of butter and a bit of chicken broth. No more eggs, rice, apples, tomatoes or potatoes. Nor condensed milk, which I missed as my sugar sweet treat on the challenge. As I type this I am waiting eagerly for midnight. Waiting for the pumpkin hour so that I can eat some food. I am surprisingly not nearly as hungry as last year (although I have reduced a least 1 1/2 kilograms and my Dad, visiting tonight, commented on my glowing skin – note to self, eat more brown rice and avoid caffeine). But I had one of those awful work days and I would really, really like some chocolate. The last three days were both easy and hard on the challenge. Brown rice filled me up. It was a surprisingly good food choice. I worried about it using up such a large allocation of my diet, but in the end it was a good staple choice. On Wednesday I had three challenges. Firstly I went to a big la-de-dah cocktail function for a farewell. I avoided the alcoholic drinks and stuck with water. I also left straight after the speeches, in part to avoid the buffet banquet (the smell wafted throughout the room and smelt soooo good). I hope people didn’t think I was rude, but I thought it best not to be around such lovely food and drink. My second problem was that my pumpkin friend forgot the pumpkin (again). I don’t think he quite realised how little food, or variety, there is on a $2/day challenge. I substituted 50c worth of potatoes. This then threw out my menu planning, as I had planned to make pumpkin soup and pumpkin congee. The potato also wasn’t quite as nutritious. My third issue was that I decided to make a simple dinner with someone else – who wasn’t doing a $2/day Live Below the Line challenge. I was going to cook two separate meals, but that seemed silly. 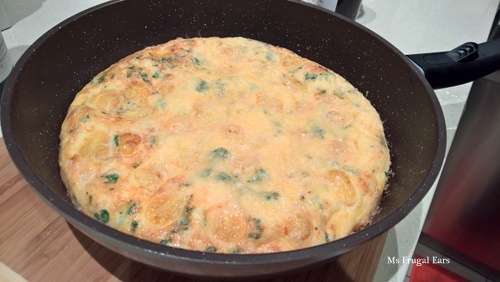 So I opted for a potato, tomato and egg omelette/frittata. I ate a two-egg portion for dinner, and the rest for breakfast. My portion did not have grated Parmesan cheese on it. I had brown rice and potato fritters for lunch on Thursday, which I had prepared the night before. They weren’t as delicious as freshly cooked, but weren’t too bad. 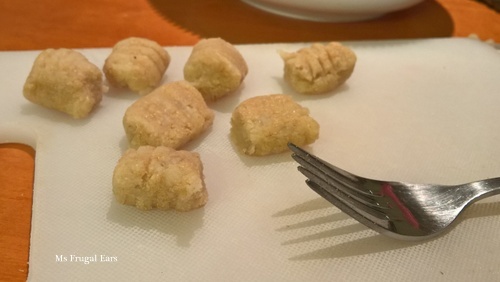 That evening I decided to experiment with potato gnocchi, bound together with rice bran. I made the rice bran by putting the rice in a food processor, and then sifted the bran away from the white rice. It took ages to pulverize. The potato gnocchi looked pretty, but they were a disaster! They started to disintegrate into the boiling water rather than float to the top. I rescued some and ate with butter. I then sliced a potato and fried in butter to eat (OK, not healthy but my overall calories are way down). 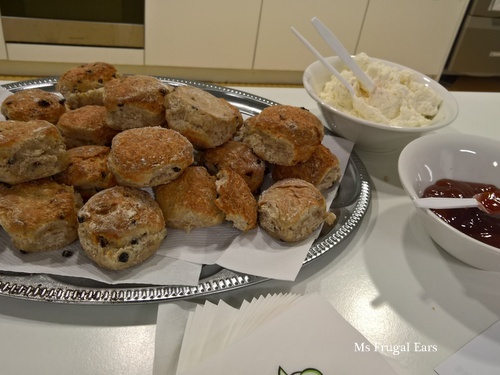 This morning I was on a training course and was tempted with freshly baked scones, jam and cream. My, they smelt soooo good. I managed to avoid temptation though. Doing this challenge has made me realise how much food related hospitality happens on a regular basis. No wonder I have trouble controlling my weight. 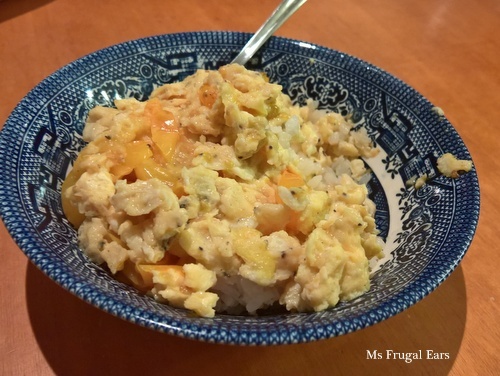 My last dinner on Friday was a simple dish of stir-fried egg and yellow cherry tomatoes, served on white rice (the leftovers from the rice bran experiment). I was generous and gave some of the rice to my kids. I was surprised how hungry I was and how much I ate. White rice did not fill me up the way that brown rice did. It was really yummy, though. I would like to thank everyone for their support. The Live Below the Line challenge is never easy. Your support helps me to keep going. So far I have raised over $577 dollars to support the work of Oaktree in reducing global poverty. And I have learnt a lot about living on less. Thanks for doing this challenge Serina and for sharing your experiences. It sounds tough but you have come through with flying colours. Thank you. I think the gnocchi concept was sound. I have made them before – just with plain flour rather than rice bran flour. Doh! I did manage to dredge a few out and fry in butter. Maybe they would all have been better done this way.